Every pebble in a stream, every cloud in the sky, and every diamond is unique. The main quality that differentiates one diamond from another is its clarity characteristics, both in or on the stone. Within the diamond, there can be internal flaws, also known as inclusions, such as pinpoints, needles, twinning wisps, crystals, and more. A diamond with twinning wisp inclusions. diamond’s structural integrity (i.e. 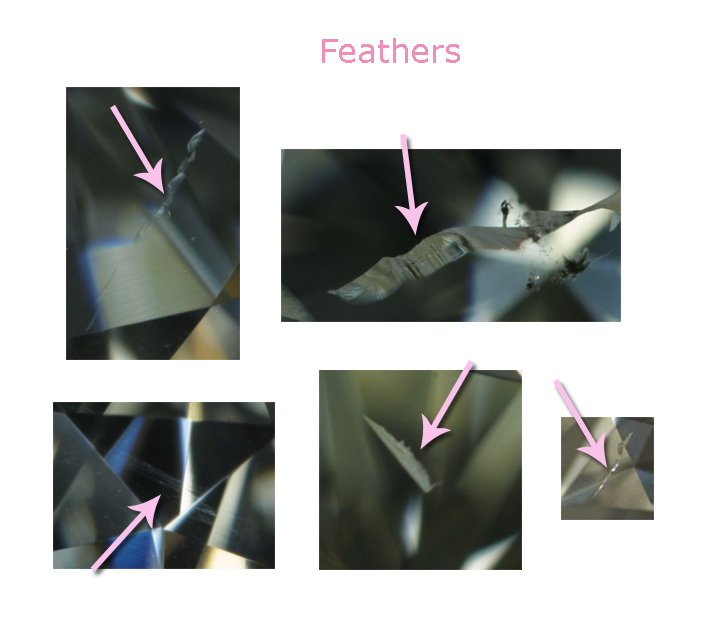 feathers that fracture the entire stone), that can be seen by the naked eye (i.e. large, black crystals in the center of the diamond), or that could interfere with the light return of the diamond (i.e. multiple inclusions that act like a cloud on a sunny day). A diamond under 10x magnification and its corresponding plot chart. You may not notice all these things yourself, though. That’s why all diamonds assessed by a GIA-certified Gemologist are given clarity grades. There are eleven grades in all, which are noted by a corresponding abbreviation. Clarity grading is based on the number, location, and size of the inclusion(s), with the most extensive flaw being the characteristic that determines the diamond’s grade. Graders will plot, or map, the location of the characteristics and provide a key on a clarity certificate so that you know where the inclusions are and can identify them in your diamond. Since diamonds are graded under 10x magnification, the naked eye will usually not see any of the characteristics in stones graded higher than VS (very slightly included, meaning the diamond has a very small amount of inclusions). Once in the SI (slightly included) range, you may start to see glimpses of the characteristics without magnification. A 118 carat Flawless (F) diamond, sold at auction by Sotheby’s in Hong Kong in October of 2013. It is the largest diamond ever sold at auction and commanded a record breaking $30.6 million price tag, the most ever paid for a white diamond. Diamonds with higher clarity grades are of greater value not only because they reduce the aforementioned concerns but because they are simply rarer. The rarest of them all are called flawless diamonds (clarity grade F), and are without any internal or external clarity characteristics. The external clarity of a diamond can, of course, change over time, even if flawless internally (clarity grade IF). While diamonds are the hardest material found in nature (they can be used to cut through any known material on earth) and are inherently resistant to external damage, they are not the toughest material in existence. Diamonds can still scratch, break, and chip if hit hard enough against another hard surface. You may have heard horror stories of diamonds with “chunks” suddenly missing from them—this is why! So, even after selecting a diamond with a high clarity grade, think twice about wearing your diamonds while weight lifting or rock climbing! Given the expense of a high clarity grade stone, bear in mind that you can use clarity characteristics to your advantage. If the stone has a low clarity grade but the inclusion is located towards the edge of the stone, for example, it can be covered up with a prong. Not only would you be saving money on the lower grade diamond but you’ll be able to hide the flaw quite, well, flawlessly. An example of a heavily included diamond. Also remember that a clarity grade can be based on things that aren’t as important as you think. Sometimes, the lower grade may be due to the inclusion of a crystal, such as a garnet or peridot or in the shape of a heart, that adds sentimental value if that crystal is the wearer’s birthstone or what have you. Some flaws also may not be as noticeable as you’d expect based on the certificate’s plot, especially when it comes to light versus dark. A diamond with a red garnet inclusion. but clarity is part of a sliding scale so you may find you don’t need the Flawless stone (especially knowing it may turn into an IF after a few wears!) or even the VS, as you found the perfect SI stone that, hard as you try, you cannot actually see the internal flaw. If you decide on a lower clarity graded diamond, you may even be able to get a larger carat or better colored diamond for a similar price to a F or IF stone. Clarity grades, while important, are subjective. So be sure to see them for yourself. Comparing diamonds side by side will help you decide in what clarity range you want to be and, more specifically, which stone speaks to you.